Affiliations: 1 Kyushu University, Fukuoka, Japan; 2 Agilent Technologies Co. Ltd, Hachioji, Japan; 3GL Sciences Inc., Shinjuku-ku, Japan; 4 AMR Inc., Meguro-ku, Japan, 5 CTC Analytics AG, Zwingen, Switzerland. 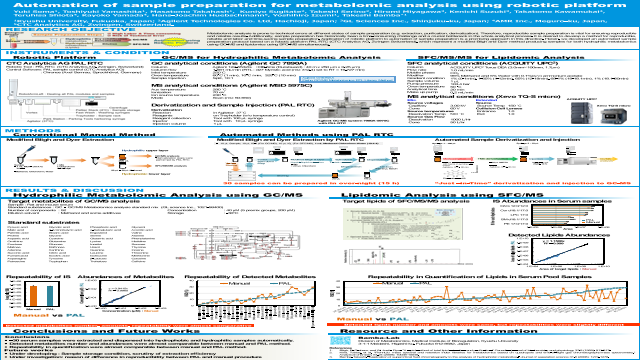 Abstract: Metabolomic analysis is prone to technical errors at different states of sample preparation (e.g. extraction, purification, derivatization). Therefore, reproducible sample preparation is vital for ensuring reproducible and reliable results. Additionally, sample preparation has historically been a time-consuming challenge and a crucial bottleneck in the whole analytical process. It is desired to develop a method for reproducible, reliable and labor and time-saving sample preparation. Application of robotic platform to automation of sample preparation is a promising approach in this direction. Herein, we developed an automated sample preparation protocol based on a robotic platform PAL RTC (CTC Analytics AG, Zwingen Switzerland), which represent a modified Bligh and Dyer method producing samples for both hydrophilic metabolomics using GC-MS and lipidomics using SFC-MS simultaneously. Summary: ・We developed an automated sample preparation protocol based on a robotic platform PAL RTC, which represents a modified Bligh and Dyer method producing samples for both hydrophilic metabolomics using GC-MS and lipidomics using SFC-MS simultaneously. ・~30 serum samples were extracted and dispensed into hydrophobic and hydrophilic samples automatically.References: 1 Bligh, E. Graham, and W. Justin Dyer. "A rapid method of total lipid extraction and purification." Canadian journal of biochemistry and physiology 37.8 (1959): 911-917. 2 Kind, Tobias, et al. "FiehnLib: mass spectral and retention index libraries for metabolomics based on quadrupole and time-of-flight gas chromatography/mass spectrometry." Analytical chemistry 81.24 (2009): 10038-10048. 3 Bamba, Takeshi. "Application of supercritical fluid chromatography to the analysis of hydrophobic metabolites." Journal of separation science 31.8 (2008): 1274-1278.